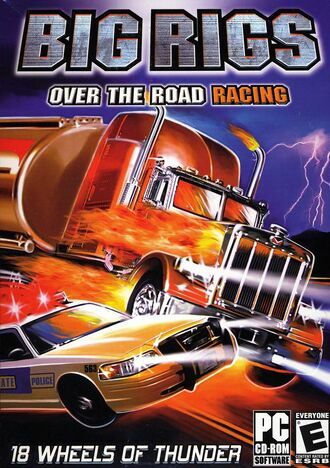 Big Rigs: Over the Road Racing is a 2003 racing game released in 2003 and made by Stellar Stone for the PC. The packaging indicates that the player must deliver illegal cargo before a competition across the United States while being chased down by the police. False Advertising: There are no police chases, no delivering illegal cargo, and every screenshot on the packaging is fake. This game was released in its pre-alpha form. The game was actually advertised as an era-breaking phenomenon upon release. It actually was era-breaking, but not in the way that the developers hoped. No challenge whatsoever. The opponent has no AI, thus never moves, making losing impossible. A patch was released to fix this, giving the opponent AI, but even then it never makes it to the finish line because there's no loss condition programmed into the game. The opponent stops near the finish line and never makes it across. The opponent is also very slow and can be easily caught up with, making the opponent pointless unless players decide to drive at a low speed. Because of this, it is impossible to lose the races. In the unpatched game, there is a fairly high chance that the player will win the race when they cross the starting line. Trying to install the patch can make the game unable to boot up. There are a variety of ways to make the game crash. The trucks can accelerate almost indefinitely in reverse. This emits a painful noise from the engine going to such a high pitch. The truck also stops immediately as soon as the player stops reversing. The maximum reverse speed of the truck is 12.3 undecillion miles per hour (1.23×1037 mph) or over 1028 times the speed of light: this is fast enough to cross the entire observable universe in 160 picoseconds (in the same period of time, light would have traveled about 2 inches). Above this speed (which takes about 50 minutes to achieve), the odometer changes to "1.$" and every checkpoint turns green, and the player instantly wins the race. However, if the player releases the acceleration, they stop instantly. The checkpoints (which are called Ultra-Nav in the game) are badly programmed, and often the game counts them out of order as well as occasionally making the player win as they drive through the first checkpoint. The random race mode is capable of making the game glitch and causes the player's truck to stutter in movement. Turning off the game doesn't fix this bug. Not even by uninstalling and then reinstalling the game. The ground clips through the road as if there are areas left unpaved. The player's truck can travel faster uphill than on flat surfaces. This seems to be a glitch like Straferunning in the original Doom, where the game calculates the player's total speed when they are moving on more than one axis using vector addition (in this case horizontal speed + vertical speed). No collision detection on anything but terrain. The player is able to pass through virtually everything in the game, including buildings, and the truck will simply pass through bridges rather than going over them. There is also no system for simulating terrain's effects on the truck: the truck treats every surface as if it is flat, easily accelerating up even the mountains that are supposed to act as barriers at the edges of the track. This allows the truck to enter the formless grey "out of bounds" void. There are only five stages. The stage "Nightride" or "Small Town Road" crashes the game if players select it. Selecting them in a patched version of the game loads up a duplicate of one of the other tracks. There are only four trucks (Which are actually based on the Volvo NH12 and FH12), with no differences in performance. Every truck possesses the same stats and only vary in looks. The infamous "YOU'RE WINNER !" (sic) (which was later fixed to "YOU WIN!"). There are no other sound effects besides the truck engine. The game has music, but none of it is actually programmed to play in-game. There is a folder with the MP3 files that would play the music within the disc. Poor visuals: these include barely noticeable water in the river, which the Angry Video Game Nerd described as "the water trying to exist, but can't". Every stage looks similar to each other, only with very little variety. Trucks are referred to as cars; even the .exe file used to start the game is named "CarZ", which will become apparent every time the game crashes. Not to mention, the game's original logo can be seen closely in the loading screen. The box for the timer is so small, the timer slightly leaves the boundary of the box. The speedometer is unnecessarily big and takes up almost a quarter of the whole screen. Depending on what version of the game is played, there are debug coordinates on display in the lower-right side of the screen, at all times, during gameplay. Some of the light posts don't even have textures. Instead, they show strange Tron-like colors that stick out compared to the rest of the terrain. Some signs appear in the middle of the road. One can find an unfinished, untextured, uncolored model of a human. Even a car can be seen without any textures applied to it on the same map that the human is on. The brake lights on the trucks are disembodied and float out a noticeable distance from the actual truck model (This can be easily noticed when driving up/down a hill). The Arc de Triomphe appears twice in a row in one of the tracks in a geographically inaccurate area, as said by The Angry Video Game Nerd, despite being in Paris. Ugly looking graphics that are worse than an early 3D mobile phone game. Despite being one of the worst games of all time and it being clearly unfinished, gamers still found some humor in the game, such as trying to find stuff to crash into, leaving the boundaries of the game, finding the countless bugs in the game and seeing how fast they can go in reverse. Even the Angry Video Game Nerd had some fun with the game, though he still called it the most broken down game he has ever played. YouTuber Thun00b stated that anyone can make a better game than Big Rigs even if they don't know anything about game design. To prove his point he made his own game. Skate 3 by EA has an achievement titled, "You're Winner", which can be achieved through winning an online match for the first time. Big Rigs was critically panned and it is considered one of the worst, if not the worst, games ever made and is compared to other classic terrible games such as Hong Kong 97, Action 52 or Superman 64. It holds a Metacritic aggregate score of 8, and it was featured on X-Play's "Games You Should Never Buy" list. Gamespot gave the game a score of 1 (Abysmal) and stated "Just how bad is Big Rigs: Over The Road Racing? It's as bad as your mind will allow you to comprehend." and that "If the goal was to create the world's most broken trucking game, then Big Rigs is a resounding success." The terrible reception of Big Rigs was not enough for one of its producers, Sergey Titov, to give up on game development. In 2012, he released a far-less-worse new game named Infestation: Survivor Stories, but it still was panned. The "YOU'RE WINNER !" screenshot later became an internet meme. This page was last edited on 22 April 2019, at 15:16.